Created through the merger of two leading Australian names in retail property, Vicinity Centres manages small local shopping centres to retail centres that can compete on any international stage. Following a period of transition to become one entity, the opportunity to align people leaders on the expectations of being an ‘everyday leader’ emerged, appreciating that it’s often the small things, done well and consistently, that have a big impact on engagement and performance. 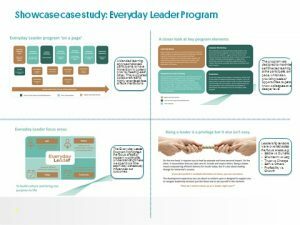 As a key part of our brand strategy of Making Things Better, Easier and More Enjoyable for our people, we took a blended learning approach to craft a new leadership development offering, the Everyday Leader Program (ELP). ELP is a six month, multi-faceted development experience comprising peer coaching sessions, eLearning modules, a People Leader Portal and face-to-face workshop, anchored by launch and graduation ceremonies. Participants were assigned to cross-functional teams tasked with collaboratively completing a series of coaching activities. Each Awesome Four team was ‘captained’ by a member of the senior leadership group whose role focused on sharing their experience and expertise relevant to each activity, promoting deeper self-reflection on the part of participants. 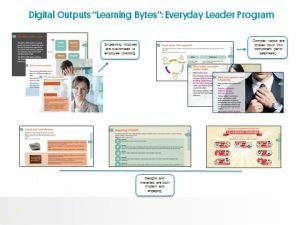 These six eLearning modules provided participants with a punchy introduction to concepts and ideas referenced throughout the Everyday Leader program. Through viewing Learning Bytes ahead of time, face-to-face sessions were freed up to focus on practical application, not theory. Online hub contained tools and resources such as blogs, videos and podcasts to support participants throughout the program. The portal housed links to key people policies and procedures that people leaders could refer to when managing their teams. Participants downloaded an app on their smart devices during the program to ensure this information was at their fingertips. This face-to-face workshop allowed deep exploration of the principles of ‘everyday leadership’ and time out of the business to connect with other leaders. It also emphasised skill application, through the completion of scenario-based activities in small groups. At the conclusion of ELP a Graduation was held in each state to celebrate participants’ progress and connect locally to share reflections and learnings. Graduation events were hosted by a member(s) of the senior leadership group, who supported the playback of participants’ key takeaways. 92% of senior leaders agreeing that their involvement as a captain added value to their own leadership experience. Based on this success, phase two of the ELP is currently being planned.